Double opt-in refers to when someone has subscribed to a newsletter or other email marketing message by explicitly requesting it -- and then also performs the secondary step of confirming the email address to be her own. This is accomplished by sending an email to the subscriber that contains a confirmation link in it. The subscriber is not added to your active subscribers, until after they have clicked on this confirmation link. This eliminates the chance of abuse where somebody submits somebody else's email address without their knowledge and against their will. And it's a great guard against spam bots. 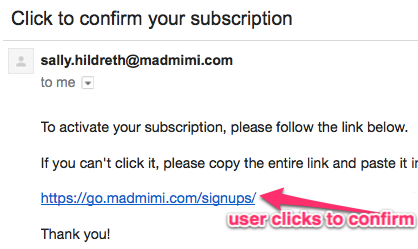 All signup forms are double opt-in by default, but this is optional. You can change any of your forms to single opt-in, easily. So, What If I Buy An Opt In Email List?